Heron of Alexandria (c. 10 CE - c. 70 CE) was one of the finest mathematicians and inventors that the world has ever known. Worthy of mention alongside the great Archimedes, he began to explore the practical uses of mathematics rather than concentrate upon number relationships and esoteric, abstract mathematical laws. Heron can legitimately be called a 'Father of Physics', because he moved away from pure reasoning towards empirical experiments, a break from the deductive approach of previous mathematicians. 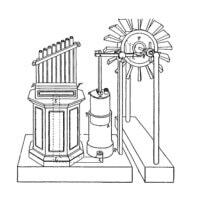 Heron, also known as Heron of Alexandria, developed many machines and mechanical devices with practical uses, showing that it was possible to take theory and put it into practice. A coin operated 'Holy Water Dispenser'. These inventions reveal just some of the unbridled creativity and passion contained in this genius' mind, coupled with an excellent grasp of mathematical principles. He and Archimedes were far removed from the philosophers such as Socrates and Plato, who believed that all of the laws underpinning the universe could be uncovered by deduction and reasoning rather than through practical experimentation. 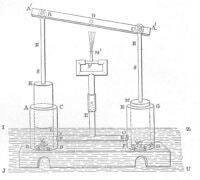 Heron's most famous invention was his Aeolipile, a device which showed how to unlock the power of steam, centuries before De Garay, Taqi Al-Din, Watt, and Trevithick. The Aeolipile consisted of a copper stand resting upon a boiler, with two pipes rising perpendicularly from the surface. These both bent inwards by 90 degrees, acting as an axis for a pivoting sphere with two oppositely bent nozzles protruding from its surface. As the water in the boiler gave off steam, this made its way into the sphere and was ejected from the nozzles at high speed, causing the sphere to rotate. Heron designed an automatic temple door opener, which used heat and pneumatics to open a set of temple doors. To open the doors, the priest lit a fire on the altar, heating the air within and causing it to expand. This expansion in volume forced water out of the sphere and into the bucket, which moved downwards under the extra weight. This bucket was connected to a rope coiled around a spindle and, as the bucket moved downwards, this spindle revolved, making the doors open. Once the fire died down, the air contracted and, to avoid leaving a vacuum, the water siphoned from the bucket back into the sphere, causing the bucket to rise with the aid of a counterweight. As a result, the doors swung shut. While there is little evidence that he actually built this particular device, one can only imagine the wonder of a congregation seeing this machine in action; they would surely have believed that it was magic! The Dioptra was a practical invention of Heron that became a foundation of surveying as the Ancient Greeks built sprawling cites and erected great temples and monuments. It also became a mainstay of the Greek astronomers, allowing them to judge the position and elevation of celestial bodies. 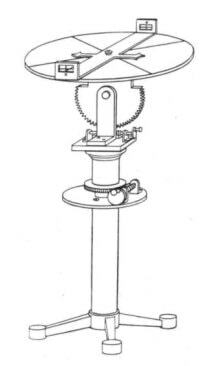 This device, later adopted by the Roman agrimensores, is an ancestor of the modern theodolite and used similar principles. The Dioptra may have existed before Heron's time, but he wrote an extensive treatise about the use of this device. The device consisted of a circular table fixed to a sturdy stand, and this was calibrated and inscribed with angles. The surveyor leveled the device, using small water levels for accuracy, and used the disc to measure the angle between two distant objects with the aid of a rotating bar fitted with sights. Using triangulation, the surveyor could also measure the distance between two objects, especially if the terrain as too difficult for Heron's other surveying device, the Odometer. Cleverly, the rotating disc could be tilted, allowing surveyors and astronomers to make vertical measurements, adding to the versatility of this useful surveying device. Heron used many methods to power his machines, from fire to counterweights, and steam to waterpower. He also used one of the simplest sources of free energy, the wind, to create a wind-powered organ. Heron's organ included a small windwheel, which powered a piston and forced air through the organ pipes, creating sounds and tweets, 'like the sound of a flute'. 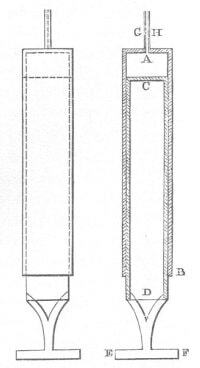 This device is believed to be the first example of wind powering a machine. Sources suggest that Heron created the first programmable robot as a device to entertain audiences at the theatre. In about 60 CE, he constructed a cart with rope wrapped around two independent axles, with a falling weight to provide power. Using pegs projecting from the axle, Heron could vary how the rope was wound around the axle, allowing the robot to change direction and move along a pre-programmed course. This primitive mechanism is very similar to a modern binary computer language; old fashioned punch cards operated on exactly the same principle. Heron used the same system of ropes, cylindrical axles and knots to create a mechanical play of almost 10 minutes in length, including dropping metal balls onto a sheet of metal to resemble thunder. Heron is credited with inventing the first vending machine, a device to dispense holy water, where a worshipper inserted a coin through a slot. This fell onto a tray connected to a lever, and the weight of the coin opened up a valve that let water flow out. Eventually, the coin slid off the tray and, with the aid of a counterweight, the lever snapped back into place, ready for the next worshipper seeking divine favor. One of Heron's lasting contributions to science is the syringe, a device he used to control the delivery of air or fluid with precision. The device, as with modern syringes, used suction to keep air or liquid in place and, when the plunger was depressed, this forced the liquid out at a controllable rate. This device, while much larger than the tiny modern syringes, is unmistakably their ancestor. Heron's fountain was an enigmatic invention, a fountain that seemed to power itself, and used some very sophisticated pneumatic and hydraulic principles. The fountain contained two reservoirs, one of which was filled with water. As water was poured into the upper tray, it flowed down to the first reservoir, where it compressed the air. This compressed air was forced into the second reservoir, where it forced the water out and created a powerful jet. This device operated until the bottom reservoir became filled with water, when it had to be reset. These are only some of Heron's inventions, and he also wrote about a fire engine and rapid-fire crossbow amongst many other wonderful devices. As is the case with Archimedes, we can never know for certain if he actually built any of these devices but, amongst his large body of work, you can see the engineering and mathematical genius of this Greek philosopher, mathematician, and inventor. I have to admit that Heron of Alexandria is a personal favorite of mine and a true genius. However, while we concentrate upon his wonderful machines and devices, we must also remember that he was also a brilliant mathematician and geometer.